iDance4aCURE is a campaign spearheaded by The Brad Kaminsky Foundation, a 501(c)3 not for profit charity, that is dedicated to actively raising funds and awareness for childhood cancer research. When Dancers Burlington met this organization at a Nationals Dance Competition in July 2015, a powerful and unstoppable collaboration was formed. 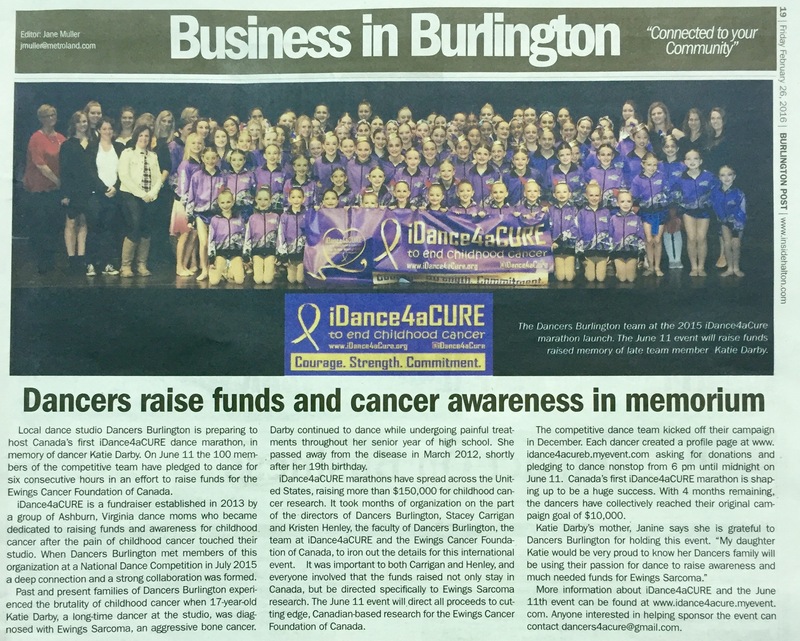 Childhood cancer is a cause close to the heart of Dancers Burlington, as we experienced the brutality of the disease when our kindhearted and beautiful dancer, Katie Darby, was diagnosed with Ewing’s sarcoma, an aggressive bone cancer. Despite the harsh diagnosis, pain and suffering that our brave Katie endured, she believed in a cure and put up the most courageous fight. Not only was she extremely talented, intelligent and thoughtful, but she was also always full of energy, life and genuine love. We lost Katie in March of 2012, just after her 19th birthday. It is now our responsibility to continue Katie’s mission and fight for a cure. 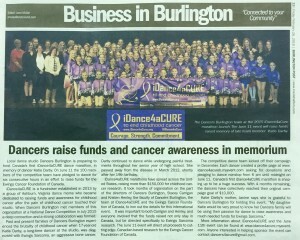 Our dancers’ contributions and support for iDance4aCURE was recognized in the Burlington Post in February 2016. In June 2016, Dancers hosted iDance4aCURE’s first international fundraising event; a Dance Marathon where participants pledge to dance nonstop for 6 consecutive hours. With the support of the generous community, the event included celebrity choreographers from around North America, a DJ table, live entertainment, a red carpet experience, the presence of news crews and photographers, and much more! All 100 dancers of our competitive team pledged to raise at least $100.00 to contribute to the studio’s $10,000.00 fundraising goal. We can proudly say that our dancers quickly surpassed this amount and, that with three months still remaining, had already raised over $11,000.00! We are proud to announce that, with our final fundraising total of $55,000.00, we are officially the highest fundraising studio in the history of iDance4aCURE!!! All of the proceeds will fund cutting edge, Canadian-based, and desperately needed research through Canadian Registered Charity, The Ewings Cancer Foundation of Canada. We believe that by hosting an inspirational, successful and unforgettable event, together, we can have a dynamic impact on the community and make a meaningful difference in the lives of the children and families affected by the horrors of childhood cancer. Funds fuel research, and research results in better outcomes and more promising futures for innocent victims of childhood cancer. Sickness and children do not mix. They are an uncomfortable and uneasy combination, but they are an ugly and cruel reality we face. With more courage, strength and resilience than imaginable, children like Katie put on their brave faces day-to-day and give us countless reasons to fight with them. Our dancers promised to come together to dance for those who can’t. The night was filled with joy, excitement, passion, inspiration and a whole lot of fun! We definitely felt Katie’s presence at the event and know that she was looking down on all of us that evening. In honour of our Katie and all the warriors and angels, thank you to everyone for your support and for joining us on this powerful journey. For more information on how you can become involved please visit http://www.idance4acure.org.